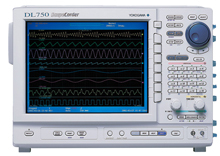 This Test of Time 2008 Award Winner is the ScopeCorder for your varied testing needs. With up to 16 Analog channels and one GigaWord memory, this powerful ScopeCorder delivers the performance you're looking for. Just a few minutes with our powerful ScopeCorder and you will be convinced it's the right instrument for your applications.